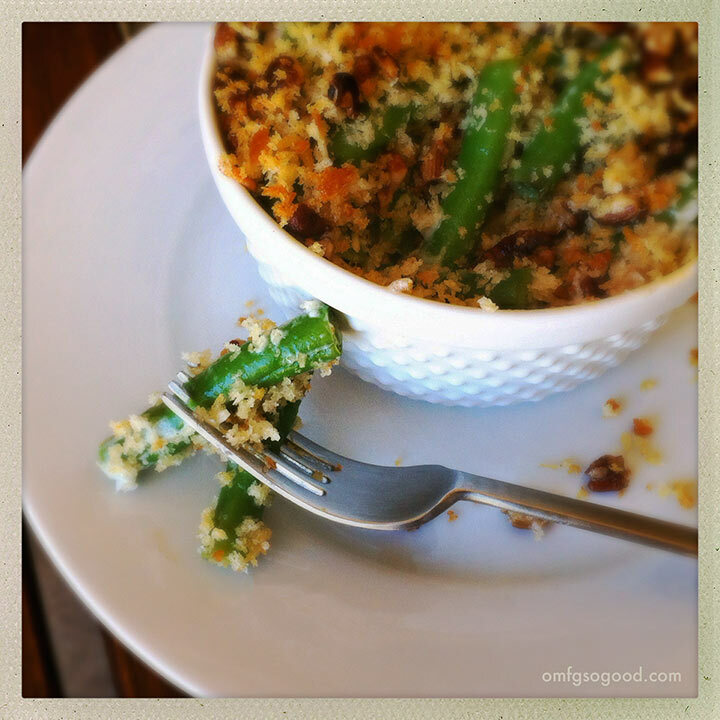 goat cheese and roasted pecan green bean gratin | omfg. so good. 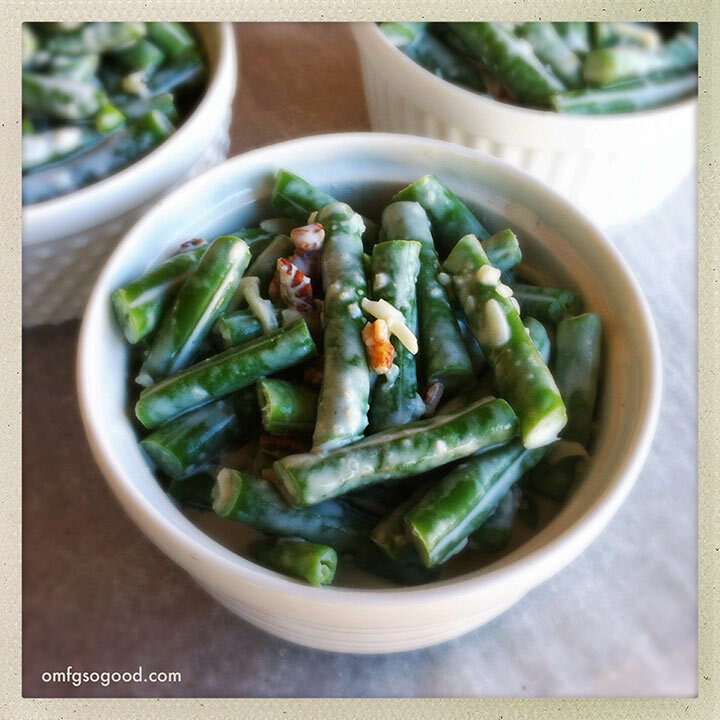 Green Bean Casserole has always been one of my favorite seasonal foods. Hands down. And oh-hoh, how it’s evolved over my 39 years. I remember thinking it was good when Mom made it with canned cream of mushroom soup, equally canned green beans, and vacuum sealed ‘french onions.’ Then realizing how much better it was with fresh green beans… and eventually making the entire dish from scratch, complete with fresh mushrooms sautéed with garlic and heavy cream, topped with my own crispy oven baked onions. All of which, is now dead to me. 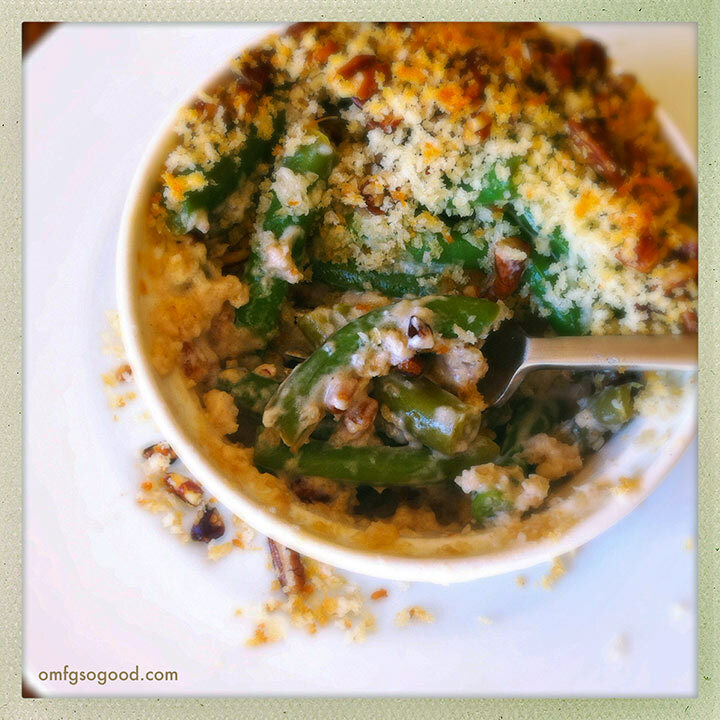 One bite of this was all it took, I was forever a changed green bean casserole devotee. I actually found this recipe in an old issue of Southern Living magazine, and wondered how I had overlooked it for this long. A few minor alterations, and BOOM. Say hello to my new favorite holiday food. To roast the pecans, preheat the oven to 350 degrees and spread the chopped pecans in a single layer on a baking sheet. Roast in the preheated oven for 6 – 8 minutes, or until they start to smell nice and toasty. Top the beans with any remaining creamy deliciousness from the bottom of the pot, cover each tightly with foil, and bake in the preheated oven for 20 minutes. 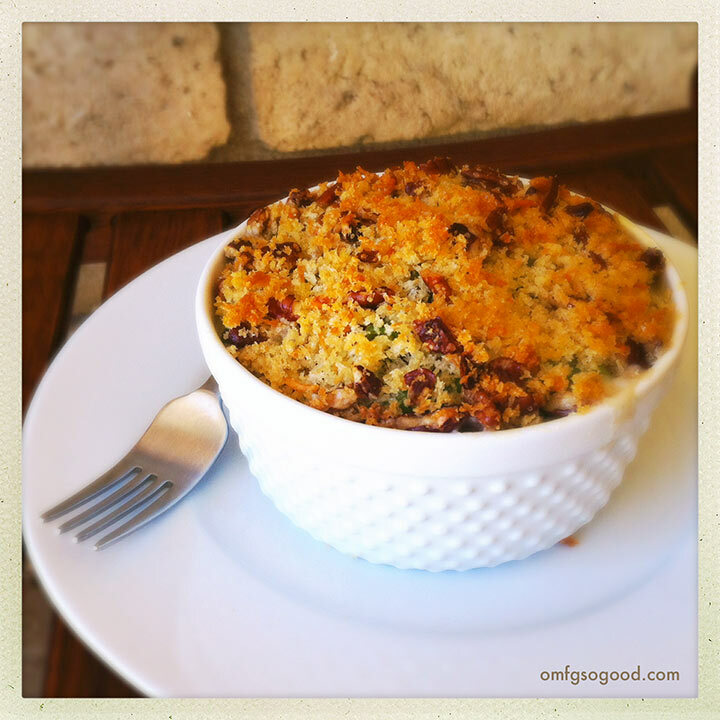 While the beans are cooking, make the crispy gratin topping by combining the panko bread crumbs, remaining 1/4 cup shredded parmesan and remaining 1/4 cup roasted pecans in a small dish. Drizzle everything with the olive oil and toss to evenly coat. Uncover the beans, and sprinkle equal amounts of the crumb mixture over each ramekin. Bake for 8 more minutes, or until golden brown. Let them sit for 5 minutes before serving. Tic-tock. Tic-tock. Tic-tock. Tic-tock. Tic-tock.